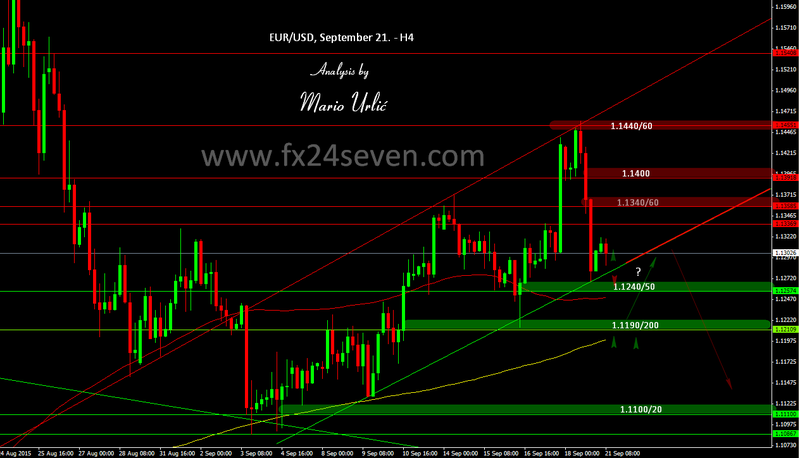 EUR/USD, what can't go up, must go down! How else to describe a failed attempt to brake the 1.1440/60 on Friday? I was pointed at that level for several times last week, as an very important level for furder gain, but it seams that the sellers were more serious then the buyers. What interesting was on Friday, when everybody thinks that the week is over, the sellers broke 1.1340/50 support and the pair fell for almost 100 pips in the last hour of trading, with 1.1268 low. The trendline stoped the fall and despite the FED’s decision to leave the interest rates on hold, the EUR/USD ended the week in red. Well, I always said that there is no surprises in the market, it’s just the way it is. If you ask me, the fall on Friday is not so strange at all, because the FED’s decision was expected. What do we now? The pair is moving between H1 MA200 and 100, resistance sellers are placed from 1.1340/50 > 1.1400. The up trend line is important now, it’s the first support, but I doubt that it could hold another sellers attack. The 1.1240/50 is next minor support, 1.1200 could be the stronger one. Is this possible move for this week? How do you see it traders, up again toward 1.1400 or down to 1.1200? Maybe the buyers have just forgot some stops on the way up? Whatever the reason is, follow the technical levels. Was on friday with sell order and have take that 100pips profit just before market has close. Now have buy order, in hope that will bounce one more time at least till 50% fibo. Will see. That fall just a day after FED tells me more then I see, but as I always said, trade what you see, not what to think. That’s why I must wait for the tehnical breakouts and then trade. Btw. This looks to me as an bearish trend for a while.